When Megan said she wanted guests posts to be Italian themed, I was stumped. You see, I don't generally like Italian food. I realize that makes me kind of a weirdo, but I'm ok with that. But then I remembered that risotto is Italian, so I was in the clear. I'm sure Megan is off enjoying some delicious cheese, wine, and gelato with Jeff right about now. Everyone I know who has been to Italy said they ate each of those things every day. I blame lack of enthusiasm toward Italian food on my lactose-intolerance. While I can eat most aged cheeses like cheddar or parmesan, I can't come anywhere close to fresh mozzarella. And gelato? Forget it. The other cheese I can eat is goat cheese. It pairs so nicely with sweet squashes in the the fall. I decided to make this meal on a week night, which was probably a mistake. Risotto always takes more time than I think it will. But this dish was definitely worth the wait. First you cook a pumpkin puree risotto. The risotto gets topped with crumbled goat cheese, fresh thyme, and some candied bacon. 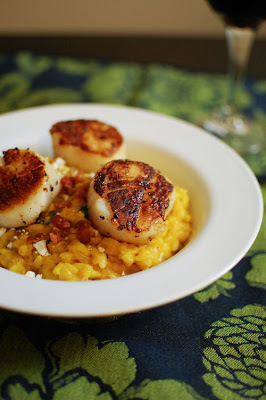 And last, but definitely not least, seared sea scallops. 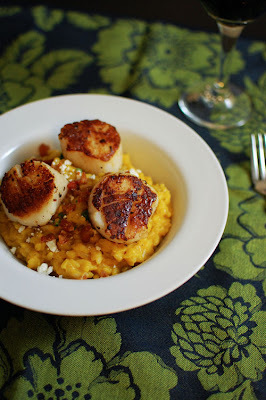 Every time we make sea scallops at home, I am reminded how easy they are and wish that we did it more often. Hopefully I follow through on that wish this time around! Congrats again to Megan and Jeff! Hope you guys are having a blast in Italy. Heat a heavy bottom skillet, over medium high heat. Add the bacon to the pan and cook until the fat has rendered off and the it has become crispy. Drain all but 2 teaspoons of grease from the pan and return to the stove, over medium heat. Sprinkle sugar over the pancetta and stir until the sugar melts and had coated the bacon. Spread the candied confetti bacon onto a sheet pan lined with parchment and allow to cool and slightly harden. Stir together the first six ingredients for the risotto into a small pot and bring to a simmer. Simmer for about 5 minutes. Remove mixture from the heat and pour into a blender with the broth, season with salt and pepper and blend. With the motor running, add 1/4 cup of butter into the blender, 1 tablespoon at a time. Blend until smooth, about 3 minutes. Pour the mixture into a bowl and set aside until ready to use. Pour the chicken broth into a medium pot and warm over low heat. Place a large pan over medium heat and melt the remaining butter and olive oil. Add the onion and garlic and sauté for about 3 minutes. Add the rice and sauté for 3 to 5 minute or until each grain of rice is coated in oil and there is a white dot in the center of each grain. Begin adding the warm broth to the rice, one ladle full at a time, stirring frequently. Each time the liquid evaporates, add another ladle of broth and continue to stir. Continue to add liquid and stir until the rice is al dente, 20-25 minutes. Stir in the pumpkin puree until completely combined. Stir in the goat cheese and parmesan until smooth. Fold in the thyme and season with salt and pepper. Heat the oil in a heavy bottom skillet, over medium-high heat. Season each scallop with salt and pepper. Sear the scallops, in batches, for 3-4 minutes on each side. Fill six bowls with risotto. Sprinkle on some crumbled goat cheese and fresh thyme. 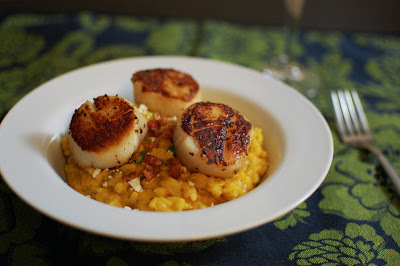 Top each with three scallops; finish each bowl with a sprinkle of bacon. Serve immediately.